“My kids’ school? Oh, it’s very close, a five-minute walk. But usually I bike, because I’m lazy,” I replied, answering my former rugby teammate’s question as we chatted during my vacation in Canada a few years back. She laughed at that. “How can you be lazy and bike? Biking is exercise.” I couldn’t convince her that it really wasn’t, that cycling was really the lazy person’s option here. And that’s when I realized that my mental framing of biking had shifted. When I moved to the Netherlands, I was not a novice biker. I had biked to school as a kid (10 km round trip, uphill both ways!) and I’d come back to it in grad school in Vancouver. I rode a fair amount, both around town and on my commute into the University. But in Vancouver it was thought of as exercise, partly because of the distance and terrain – it was a 16 km/50 minute ride and there were hills and a long slow uphill stretch coming into campus with not much to see – but mostly because it was actually the slowest way of getting anywhere and felt like the most work – why would I do it if I wasn’t getting a workout in? Because it was exercise, and thus a hobby, social norms said that it required special equipment. I had a special jacket with reflective stripes, a helmet and special clothes to cycle. I carried other clothes to change into in my sporty panniers that could be removed and carried about as a badge of my virtue (though truthfully they were exceedingly annoying to schlep). I even considered getting clip in shoes and click clacking my way around campus. I was visually identifiable as a cyclist. Cycling was also one of the most dangerous ways of getting around in Vancouver even if it was much better for my health. Most people I knew who bicycled regularly had had at least one run-in with a car, and I eventually became yet another victim of a car not looking out for cyclists. After that accident I didn’t ride so much, at first because of the injuries and later because of other changes in my life. Cycling in Vancouver was an exercise add-on to my life – not a necessary mode of transportation. 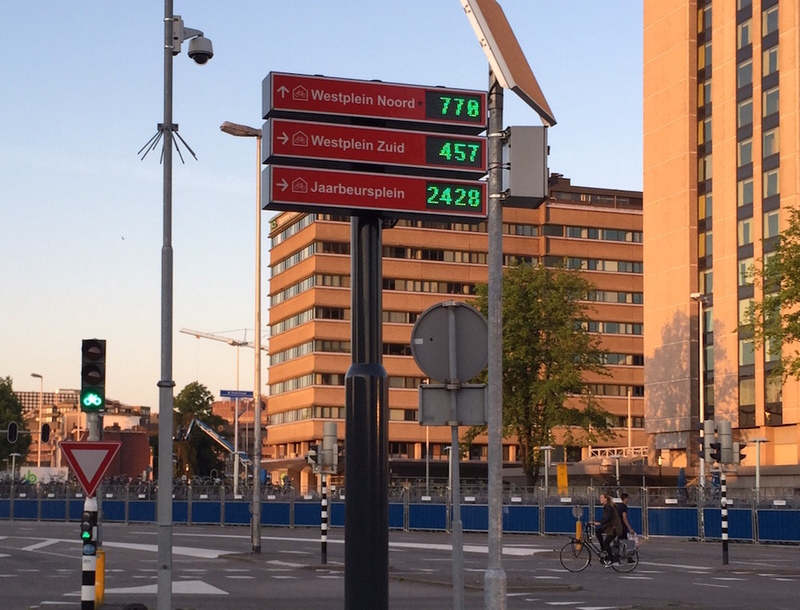 Sign showing where to find bike parking at the official lots around the station. But all that changed when I moved to the Netherlands. Here, biking is not exercise, it is just how you get places. Sure, you can exercise on a bike, and those folks don spandex and helmets and Tour de France team jerseys and head off alone or in schools of racing bikes to cycle past the fields on weekends. But that’s not the kind of biking I was talking about to my friend or what I do every day. I meant the kind of cycling that is so integrated in daily life that it isn’t anything special – it’s just the easiest way to get places. It is laziness that leads me to bike to the kids’ school. It’s faster and less effort than walking (and gives me more control of the kids’ speed and trajectory) and faster and less annoying than driving when you factor in parking at both ends. It’s not just school that’s easier to get to – it’s most of the city. It’s almost always faster or about the same to get somewhere within Utrecht by bike as by car, and buses generally take even longer. Check out this video of a bike and a car doing a Top Gear type race across town. Driving within the city is not fun or easy, and parking is expensive. But there are cycle paths everywhere, often separated from car traffic, and the network is always maintained, even in the face of construction. Bike routes get you there more directly than car routes. Bike paths are even salted when cold weather hits, with a bike path sized salting machine. 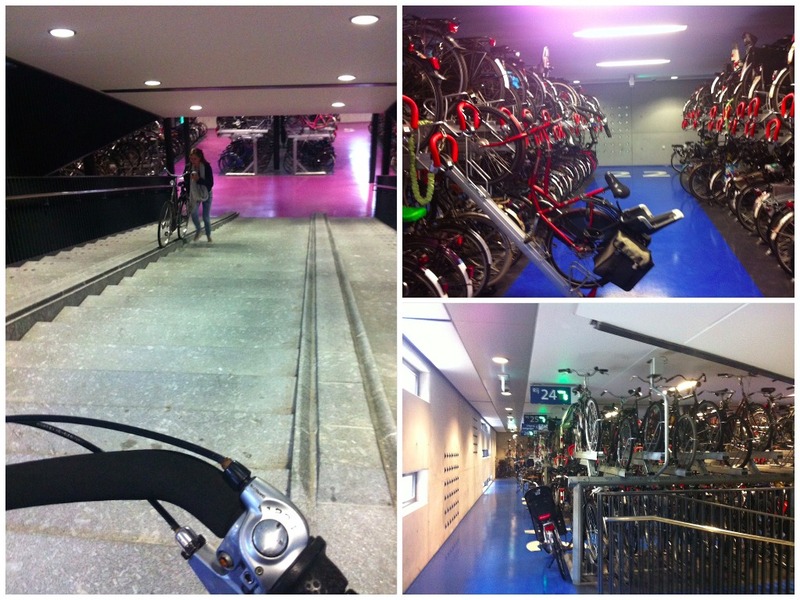 Bike parking is usually easy to find, though it can be crowded around the centre or by the train station. Though there is a lot of bike parking, but it’s still not enough. They’ve recently added a 4200 place bike parking garage on the west side of the station with double decker storage for bikes, but that’s often nearly full. They’re also building a new bike garage on the east side of the station with 12,500 spaces, that hopes to take up some of the huge number of bikes now parked somewhat willy-nilly on every side of the station. 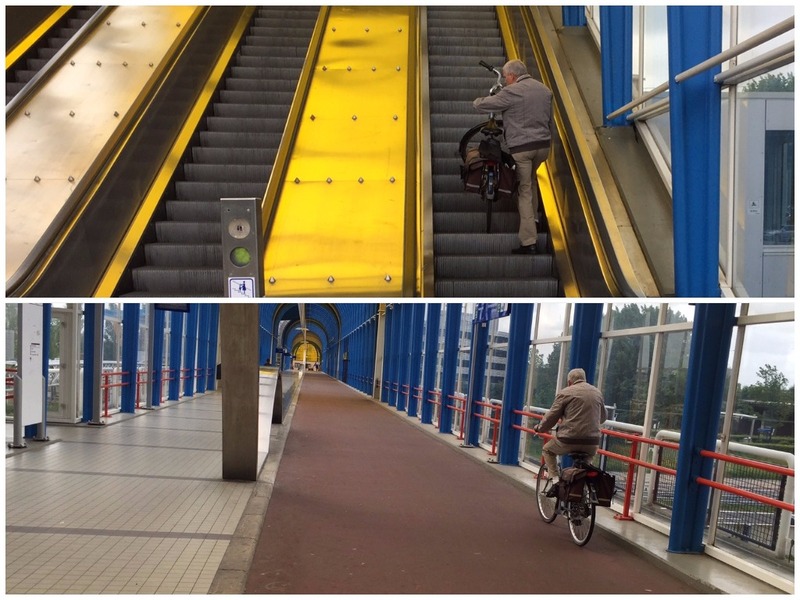 And it’s not just bike parking and bike lanes – getting around by bike is considered important, with major infrastructure dedicated to it, like this bike path over the train tracks and freeway in Zoetermeer, where you take your bike up the escalator to an elevated bike way. 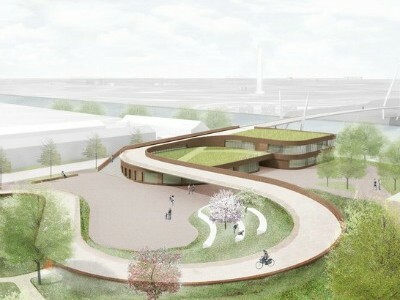 Or the new bike bridge that they’re building over the highway and canal to make it easier for people in the new area of town to reach the centre – they’re even tearing down and rebuilding a school that will now be under a bike bridge. It’s also much easier to carry stuff on bikes than it was in Vancouver. No more click in panniers that cut into my hand when I carry them – I now have saddlebags and a basket on my bike so I can get a fair amount of shopping in. Even unwieldy stuff is carried pretty frequently – it can be quite amazing what Dutch people throw on their bikes without much thought – from Christmas trees to pulling rolling suitcases to large baskets, boxes and bags. 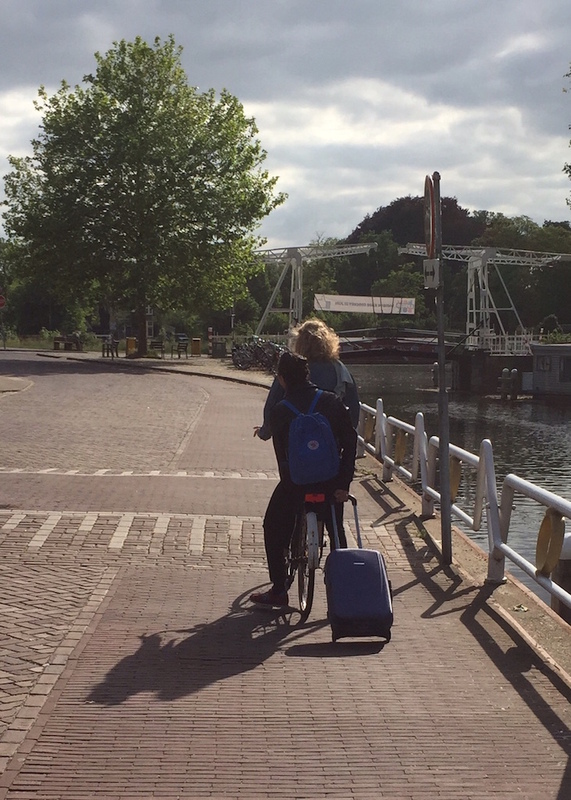 Dutch people can also take along an extra bike, pushing it beside them (the one bike skill I have yet to master). Basically, if you can still steer with one hand, you’re good to go. I realized that I’d become integrated here when I was halfway home from the station with a large heater balanced on my handlebars and I hadn’t even blinked before starting home with it. It’s not just stuff that can be carried, it’s other people. Carrying one or two kids is pretty much the norm, though three is also possible, and then of course, there are the cargo bikes. You can do a quick demographic scan of people cycling past by the size and number of children’s seats on their bike. And giving other adults a lift on the back is also very common, and equal opportunity – girls give guys rides too. You can even combine carrying people and stuff – I once saw a young woman sitting on the back of a young man’s bike carrying a full length mirror through the streets. Kids also cycle by themselves pretty quickly. Most four-year-olds can ride without training wheels and then they work up to more and more independent riding, complete with traffic training at the end of elementary school. My six year old still gets rides for trips outside the neighbourhood but my eight year old rides almost everywhere on his own bike now, especially now that we’ve just moved up a size. 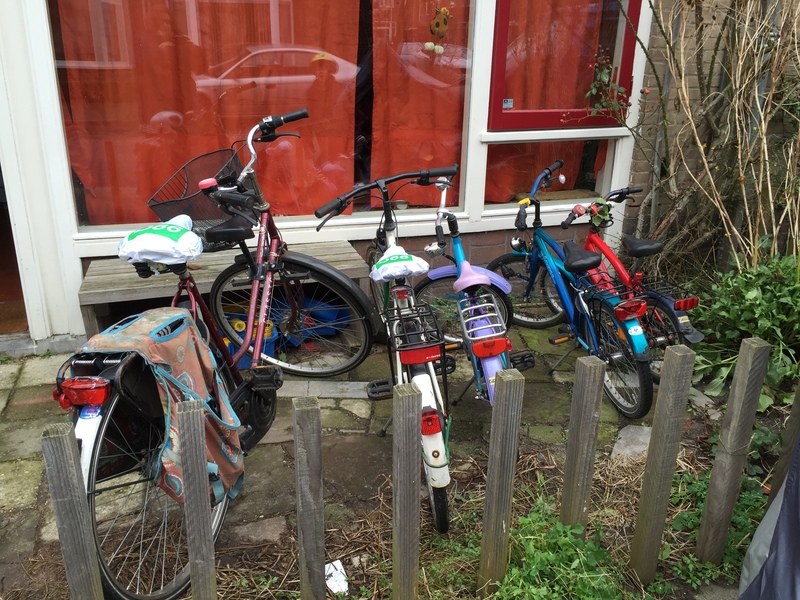 And by high school, at age 12, it’s expected that they’ll cycle without parents to school, even if it’s clear across town – though they often cycle together in big slow amorphous groups. As the groups of high schoolers show, cycling is also often gezellig (a Dutch word loosely translated as friendly togetherness, but so much more). Riding side-by-side conversing with friends or kids is the norm and legal – it’s a bit of a treat when you’re cycling home and meet up unexpectedly with a friend for a chat on the way. 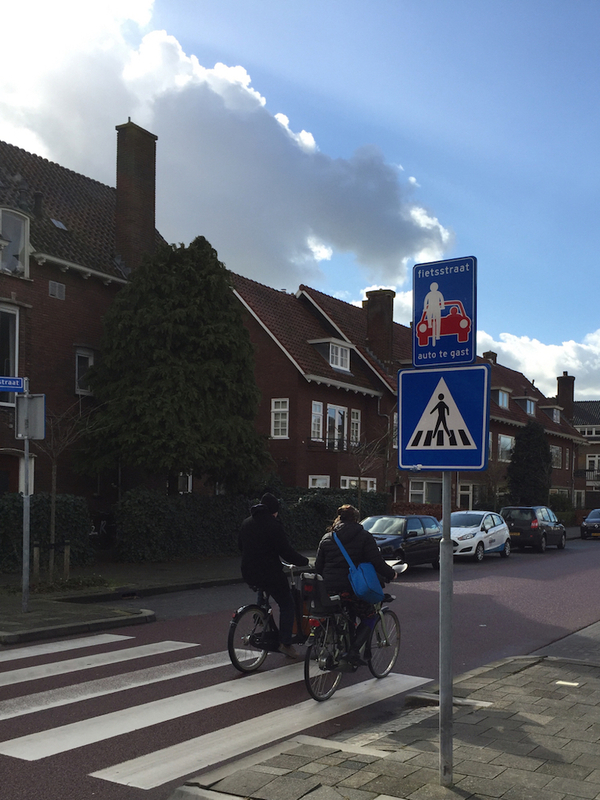 A polite tring of the bell lets you know that a faster cyclist needs to get by and cyclists will also rearrange themselves temporarily in order to let cars by, but in general cars need to wait patiently for the bikes, especially in residential neighbourhoods. And since cars are legally considered at fault in a bike/car accident (unless it can be proven that the cyclist did something to cause it), and since most drivers are cyclists too, it does work. Cycling here also does not require special clothes – you wear what you have on, even if you are going to the symphony, in heels (actually easier than walking in them). 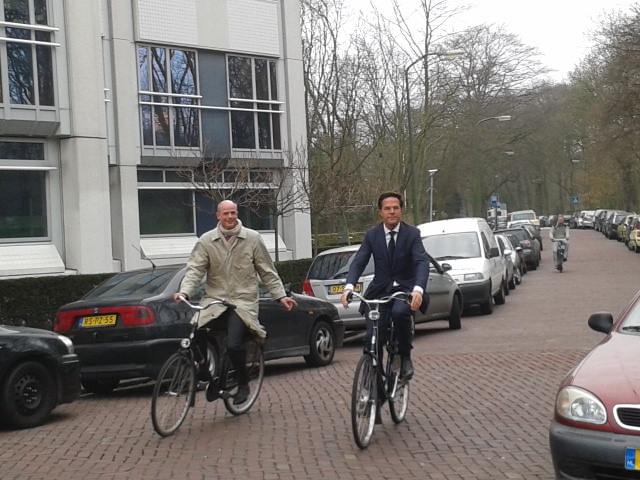 The Prime Minister even famously rides his bike to work in his suit. Mostly people ride at a moderate pace and don’t get terribly sweaty, so there is no need for extra clothes and showers, though the flat terrain helps too. And if it’s raining, lots of people just bike with their umbrellas in hand. And finally, one of the best things about living here is cycling home at night, lights sparkling in the stillness of the deep black canals. Made even better after a gezellig night of conversation and wine with friends. Cycling really is the easiest, and best, and laziest, way to get around.